Screen Innovations (SI) announced a new, more affordable projection screen for rooms with high ambient lighting. Slate, made in the USA, is a flexible multi-particle optical screen screen designed for price-conscious consumers who can’t afford the company’s top-of-the-line Black Diamond screen. 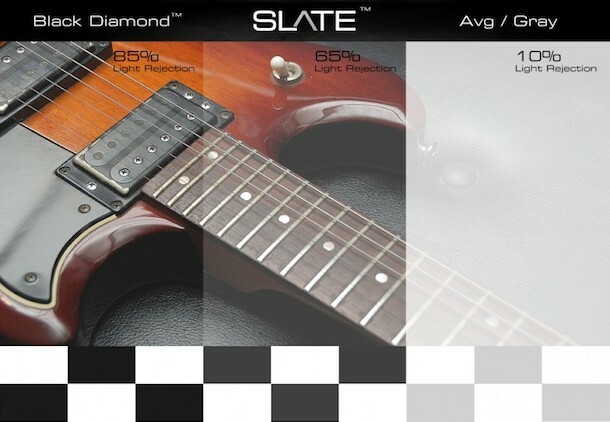 Slate rejects 65% of ambient light for more detailed projection images. SI says Slate was invented to provide the best picture for the masses. Slate eliminates the need to settle for white or gray screens. “Now, the best screen technology is available for all applications,” said Ryan Gustafson, President of Screen Innovations. The Screen Innovations Slate 100-inch 16:9 screen will be available January 1, 2014 for $1,799. Slate is available in Motorized, Zero Edge, and Fixed Frame screen formats.